While I prefer to carry full-sized sidearms, sometimes something slim and relatively light is more appropriate. For the longest time, I used a pouch made by a good friend. Made to my specifications back when I had little understanding of how things worked, it positions cartridges facing to the rear. After a decade with it, I finally turned to the more conventionally designed mag pouches, a double Galco model. On the plus side, it’s very comfortable, holds two magazines and snaps on and off the belt easily. On the minus side, it left little room for my cell phone pouch. So I am trying out a couple of single Comp-Tac pouches. The paddle model has adjustable tension and so works well for several different mags. When working with many items on a belt, it’s nice not to have to re-thread everything just to add one more. The tuckable pouch is a new favorite of mine. 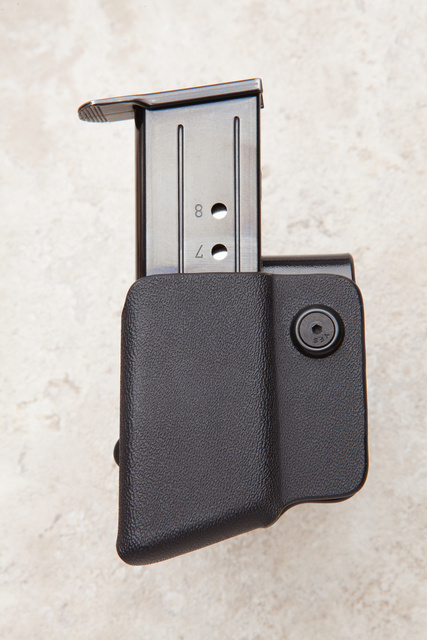 Not only does it hold a magazine comfortably and protects it from sweat, but the way it is offset from the clip allows putting the cell phone pouch right over it. The phone doesn’t interfere with getting the magazine out but obscured the clip neatly. As a result, it offers excellent concealment. In some environments that is important. 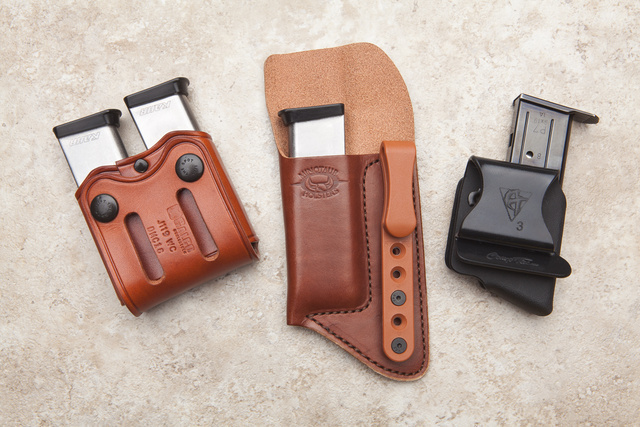 This entry was posted in holster and tagged kydex, leather. Bookmark the permalink. I’ve been using the same Minotaur IWB one for a couple years, and I agree, it’s all sorts of awesome. Full-size M&P9 magazine disappears and it’s comfy. The Galco double can hold a Surefire 6P size flashlight, at least ones made for 1911 type mags. If you position it in the front slot, it provides cover for the mag in back, if your cover garment gets pulled aside to access a pocket, etc.